Depicts: Distribution of the observed parallel velocities (blue bars) and the parallel velocity resulting from the cumulative centrifugal acceleration observed at all altitudes below each observation point (red bars). 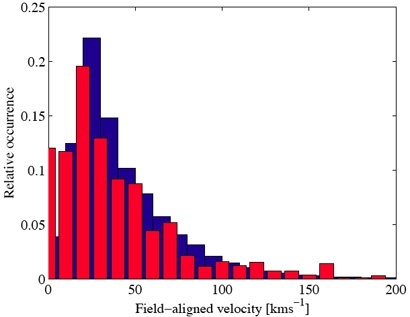 This figure depicts the distribution of the observed parallel velocities (blue bars) and the parallel velocity resulting from the cumulative centrifugal acceleration observed at all altitudes below each observation point (red bars) [km/s]. The initial velocity at the lowest altitude of the data set for each orbit has been added to make the two distributions comparable. The y-axis shows the relative occurrence. The red bars are shifted half a bin towards lower values to increase readability. For further details please consult Nilsson et al. (2008). (Image courtesy of Dr. Hans Nilsson, IRF, Kiruna, Sweden. Reproduced from Nilsson et al. (2008)).